The database can be searched by subject, including human rights, international criminal law, relationship between international and domestic law, and law of treaties; or by jurisdiction, including location of organisations/institutions or geographic region. It is also possible to filter results, including by date, author, and organisation. You can download documents as PDFs, or print/email them. If you create a personal profile you will also be able to save content and searches. 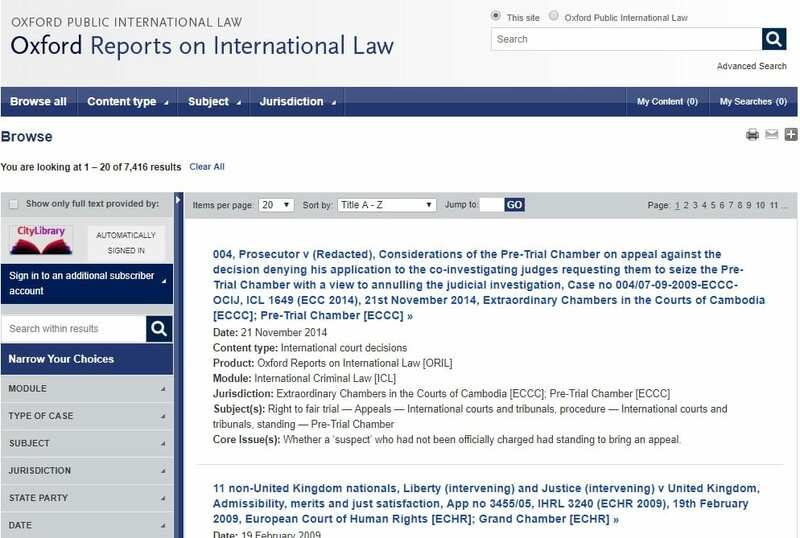 How do I access Oxford Reports on International Law? Access ORIL through the Databases A-Z list. Once in the database you can also access other Oxford databases, including Oxford Public International Law, Max Planck Encylopedia of Public International Law, and Oxford Scholarly Authorities on International Law. If you have any questions or feedback regarding ORIL please contact thomas.ellen@city.ac.uk.